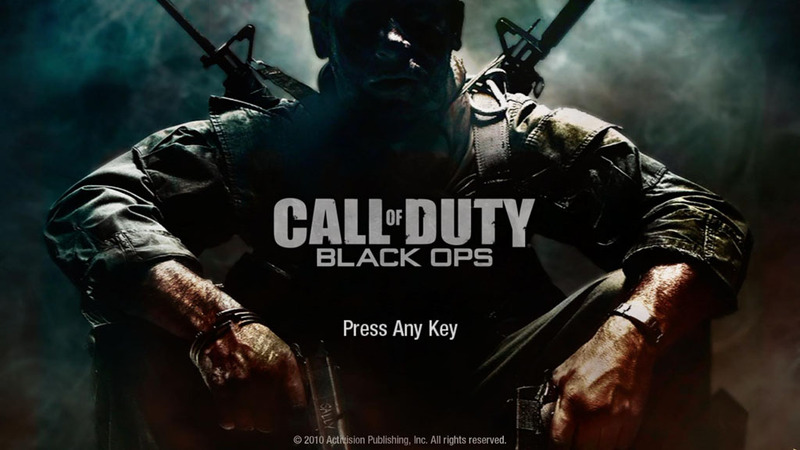 The critically-acclaimed release of Call of Duty Black Ops has brought many players from Modern Warfare 2 over to a new playing field. While the basic game play elements may be very similar, the single-player campaign tells a new story about a CIA operative named Alex Mason, who is being interrogated during the time of the Cold War. The campaign takes the player through the missions of many different characters, each playing their own part in the telling of the story. I won’t spoil anything for those who have yet to complete the single-player, however, as that is not what this article is about. One of the more intriguing parts of this game is the amount of side activities that can be found throughout the game in both single- and multi-player. First, the zombie mode brings back a few the same Easter Eggs that were brought along with World at War, as well as adds in a few new ones which help to reveal the story of how the zombies came to be. 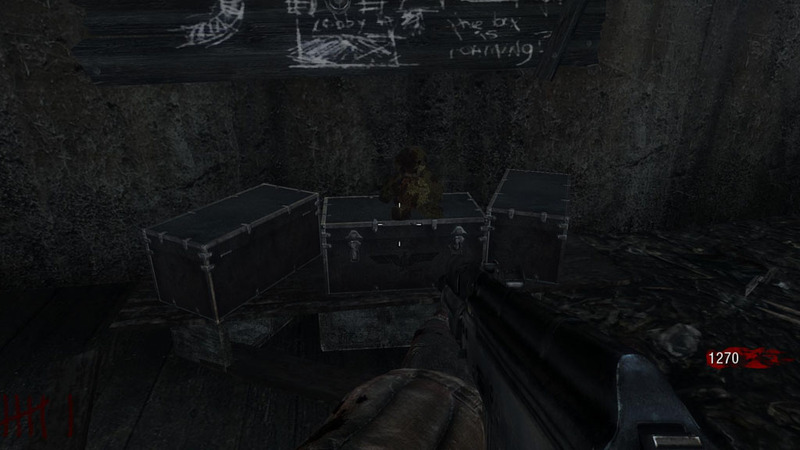 The traditional teddy bear has been seen in many Call of Duty games and again finds its way back into Black Ops. I’m not sure if it is within the single-player yet but it can be seen in nearly every room of the zombie levels. One particular thing to notice, however, is that the map ‘Kino Der Toten’ is based around a theater. The teleporters allow the player to quickly traverse the map once power has been restored. There are times when the players will be teleported to a film room where the camera is pointed toward the theater screen. Shortly after this, each player will be teleported to a separate undisclosed room that has no relevance to the map. The players are given five seconds to find a film reel in each room, which helps to slowly fill in the pieces to the puzzle of the origination of the zombies and hell hounds. This, however, is only the tip of the iceberg. The best part of searching for Easter Eggs comes in the main menu screen for single-player. If you notice, you can look around the room by moving the mouse around. If you look down, the player has a view of the restraints in the chair. On the PC, holding down the space bar will allow you to break free from these restraints, allowing you to walk around the room (the same thing can be accomplished by repeatedly pressing L2 and R2 on the PS3 and LT and RT on the Xbox 360). 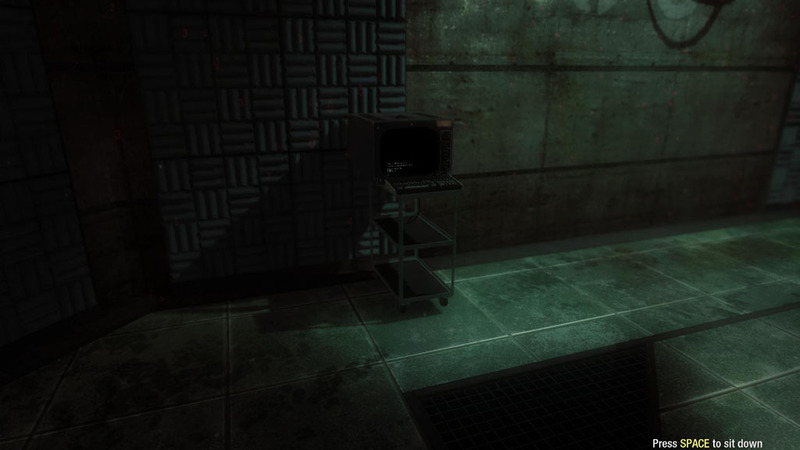 There isn’t much that can be done in this room, however, there is a computer console situated behind the chair that can be accessed by walking up to it and pressing the corresponding button that pops up. From here you are automatically logged in as none other than Alex Mason, the main character. This is where most of the fun comes into play. This computer console can take a few basic Unix commands, allowing you to traverse a limited set of directories (Unix is one of the first operating systems that was created in the 60’s that utilized console commands and is still used in many mobile devices and servers. It is also what Linux distributions and the Mac operating systems are based off of). If you happen to get lost, you can always type ‘help’ followed by enter, which brings up a list of the commands that you can use. Most people find out first about the Dead Ops Arcade game, which can be accessed by typing ‘doa’ into the console. 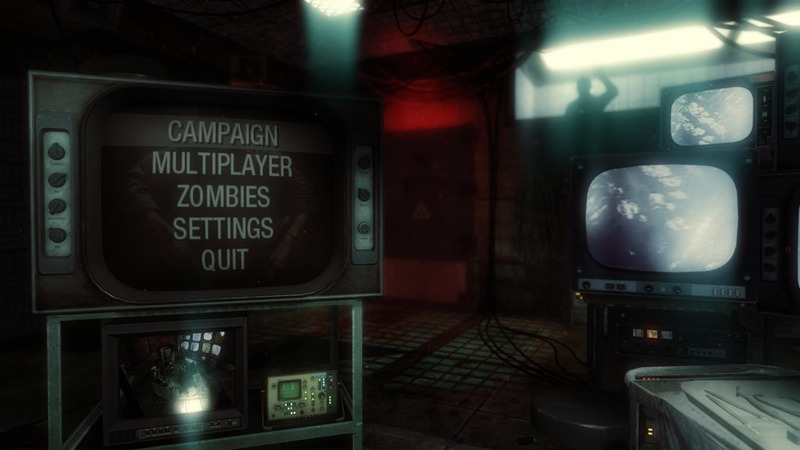 Once unlocked, this game can be played online with your friends by accessing the zombie menu. Another nifty game that can be played is Zork. Back in the 80’s, Activision bought out Infocom, which included the rights for Zork. The first installment of the text-based adventure game can be played. Many people that have never heard of the game may not see the appeal; however, with a strong imagination and a good amount of logic, this can be an extremely entertaining game. Other things that can be done include a few cheat codes. Both of these unlock certain things within the game that otherwise would be a bit more difficult to come across. The first one can be unlocked by typing ‘3arc unlock’. This unlocks the map ‘Five’ for the zombie mode. This map is in the Pentagon with John F. Kennedy, Robert McNamara, Richard Nixon, and Fidel Castro as playable characters. The other code is ‘3arc intel’. This code unlocks all of the intelligence that can be found within the single-player campaign, taking all of the work out for the player. Some may find this cheap and the game even tells you (on the consoles) that it will disable an achievement if you use this code. PC players don’t have anything to worry about, especially since most aren’t concerned with achievements. 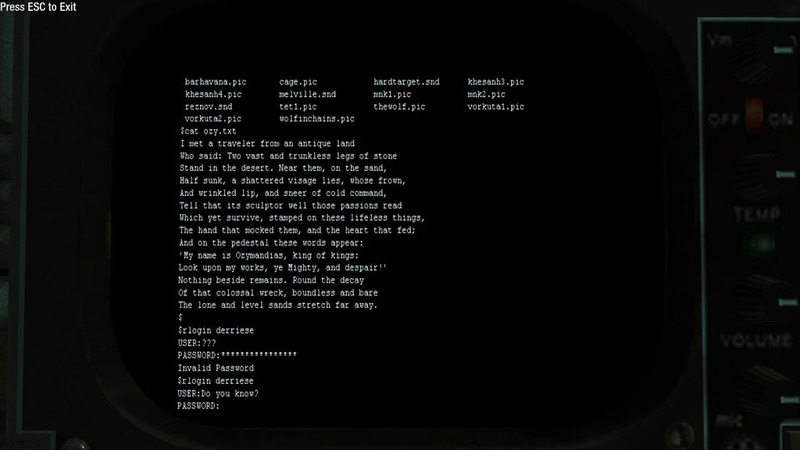 Much of this intelligence allows the player to read about a back story to the game as well as hunt for other Easter Eggs, some of which may be linked to the information found from the computer terminal. That brings me to the next part of this article, which I think is the best part of the game. 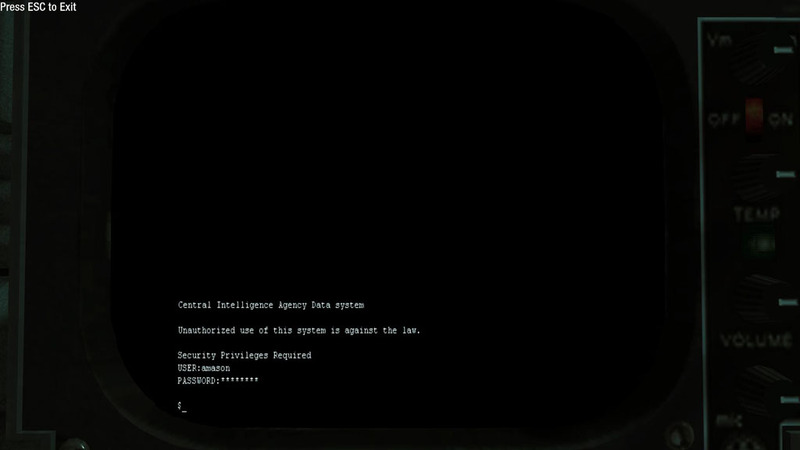 Remember when we first accessed the computer terminal? We were logged in as Alex Mason, the main character of the single-player campaign. The first thing that you should do is type out ‘help’ and then press enter. This gives you a list of the available commands with a description next to each. This will come in handy throughout this entire adventure. Now try typing out the command ‘dir’ and see what happens. A list of files appears on the screen, each of which can be viewed or listened to (assuming it is a sound file, denoted by a .snd suffix). To view these files, first type the command ‘cat’ followed by a space and then the name of the file, including the suffix. Many of these files include information that can be used to find additional information relating to the story of each character, as well as concept art and sound clips from the game. After looking through these files, go ahead and type in ‘mail’ and then hit enter. This will take you to the inbox of the person you are currently logged in as. There are eleven emails in Mason’s inbox that can be read, some of which allude to the fact that there are other users on the computer terminal. Typing ‘q’ exits the mail program. From here type ‘who’ and then enter. This allows you to see the users located on this particular server, which is the CIA server. Note that I said server; there are other servers that can be accessed. From the research that I have done, there are at least three other servers, but only one other one has actually been accessed; no one else to my knowledge has found out the user names and passwords for the other servers. To make it easier on you, I will give you a login for the server Dreamland. First, type ‘rlogin’ followed by a space and then ‘dreamland’. Then type in ‘roppen’ for the user name and ‘trinity’ for the password. This takes you into the Dreamland server under Oppenheimer. The Dreamland server mostly has information pertaining to the beginning of the experiments for the ‘Undead Soldiers’. If you read through all of the emails and the files located within this server, you can find out what happened at the beginning of the project, how some of the weapons were created that can be used within the multiplayer zombie mode (particularly the ray gun and the ‘wunderwaffe’), and learn what went wrong with the zombie project. I won’t spoil anything for you, but I will say that there are two other users located on this server, as well as a few other servers available, but as said earlier, no one has found any information on the logins for those servers. This information has led many to believe that early reports of new content can be found within this computer terminal, the only thing people need to do is find their way into the new servers. I will certainly be looking forward to these logins and finding out what is contained within those servers. If you have any information or would like to help out with finding these server logins, be sure to leave a comment below.